Every project we embark on is unique. We individually assess the requirements of each system and decide upon the best technical and engineering solution that will meet that application. We can provide a range of control and safety equipment from small fire and gas detection to large scale PLC based detection and control systems. Where systems are to be used in areas with increased safety requirements we can offer equipment that is designed to meet the requirements of IEC 61508 and capable of achieving a Safety Integrity Level of 3. Projects are managed by our in-house team of engineers who carry a number of certifications including TUV functional safety, to ensure compliance with IEC 61508 and IEC 61511. Our project engineers have extensive experience with the selection and use of fire and gas detectors and alarm indication equipment which means that we are ideally placed to provide advice on the selection and supply of the most suitable equipment and provide technical support. We are accredited distributors for Xtralis, manufacturer of the market leading Very Early Smoke Detection Apparatus (VESDA). Our engineers have over 20 years’ experience in the design, supply, installation, commissioning and maintenance of VESDA systems worldwide. VESDA Aspirating Smoke Detection (ASD) provides a high sensitivity method for detection of fires at the earliest possible stage. It is ideal for onshore and offshore control rooms, switch rooms, battery rooms, telecoms rooms, wind turbines and other high risk and high value assets. VESDA systems are complementary products to the range of different suppression systems offered by Blaze. Different alarm levels can be used to trigger different responses, giving the opportunity to investigate the source of a possible fire before initiating a release of extinguishing medium. They can be used alongside conventional smoke detectors to provide a coincident signal whereby both systems are required to detect a fire condition before any extinguishing system is released. 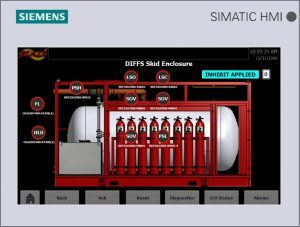 Following the introduction of the DNV standard 2.7-2 for offshore service modules we developed an integrated fire and gas extinguishing controller to meet the stringent requirements of the standard. The controller is suitable for use within non-hazardous areas when compliance with the DNV 2.7-2 is not a requirement. By combining the controller with one of our gaseous fire protection systems and fire dampers, the extinguishing medium is contained within the enclosure in the event of a fire. The Civil Aviation Authority amended regulation CAP 437 to require new Normally Unmanned Installations be constructed with Deck Integrated Fire Fighting Systems (DIFFS). For control of the DIFFS systems we have developed an explosion proof enclosure containing a SIL2 Siemens Based PLC controller. The controller will accept inputs from fire detectors located on the helideck and interpret these signals to initiate release of the system when it is required. Various communication options are available from the controller to integrate into existing platform systems. The controller also has the ability for it to be viewed and operated through an internet browser. We also provide the complete DIFFS detection package including helideck flame detectors, helideck lighting systems, remote video station and detection/activation panels. Read more about our Helideck Safety Solutions.